Father, I Praise You with a new song and declare Your glory and great works among Your people. For everything under the sun, there is a plan and purpose. 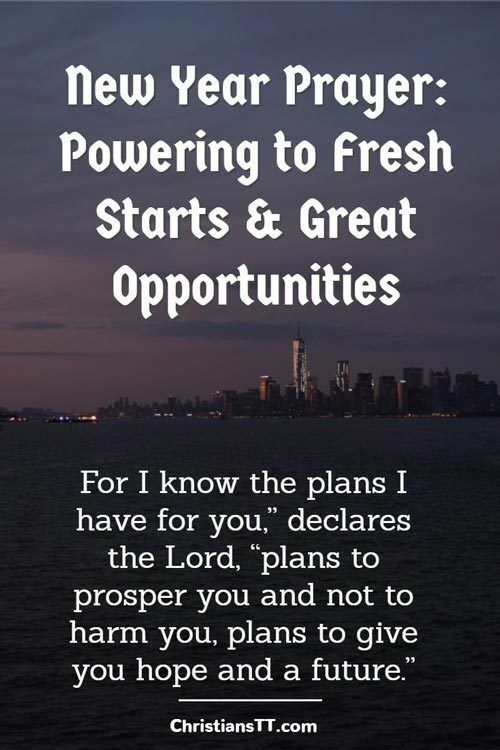 So I pray that the plans You have for those who call upon You will be manifested. Help us to believe in ourselves and know that whatever happened in the past is done! We are new creatures in Christ and will move beyond past events. With you, we will walk uprightly, because You direct our steps. We declare new beginnings and new opportunities, as we place Jesus at the center of our lives. Ecclesiastes 3:1 – To everything there is a season, and a time to every purpose under the heaven. Isaiah 43:18-19 – Forget the former things; do not dwell on the past. See, I am doing a new thing! Now it springs up; do you not perceive it? I am making a way in the wilderness and streams in the wasteland. Abba Father, as we focus on new beginnings, show us how to let go of the unforgiveness we hold in our hearts. Help us Lord to release those who have wronged us. Let us apply wisdom in all situations. In everything we do, it is my prayer that we will surrender to Your will and co-operate with the prompting of the Holy Spirit. Psalm 90:12 – So teach us to number our days, that we may apply our hearts unto wisdom. Heavenly Father, we declare that this will be a year of change. This will be a year in which we will place You in Your rightful place in our lives, so that everything will find its place and will be set in order. We will trust in You and believe that You have the ultimate plan for us. We will walk in love and unity and wait patiently on You Father, for You work all things together for good, for those who love You and are called according to Your purpose. Our hearts and lives will overflow with the abundance that will be manifested from this day. Praise be to You Almighty God, Father of our Lord Jesus Christ! May the peace of Christ rule in our hearts, in the name of our Lord and Savior Jesus Christ, SO BE IT… Amen and Amen! Mark 11:25-26 – And when you stand praying, if you hold anything against anyone, forgive them, so that your Father in heaven may forgive you your sins. Prayer and declarations For New Year’s Day – Hope, blessings and inspiration in 2019!